James Andrew Broun Ramsay, 1st Marquess and 10th Earl of Dalhousie, British statesman and Indian administrator, was born at Daihousie Castle, Scotland, on the 22nd of April 1812. He crowded into his short life conspicuous public services in England, and established an unrivalled position among the master-builders of the Indian empire. Denounced on the eve of his death as the chief offender who failed to notice the signs of the mutiny of 1857, and even aggravated the crisis by his overbearing self-consciousness, centralizing activity and reckless annexations, he stands out in the clear light of history as the far-sighted governor-general who consolidated British rule in India, laid truly the foundations of its later administration, and by his sound policy enabled his successors to stem the tide of rebellion. He was the third son of George Ramsay 9th Earl of Dalhousie, one of Wellington's generals, who, after holding the highest offices in Canada, became commander-in-chief in India, and of his wife Christina Broun of Coalstoun, a lady of noble lineage and distinguished gifts. From his father he inherited a vigorous self-reliance and a family pride which urged him to prove worthy of the Ramsays who had "not crawled through seven centuries of their country's history", while to his mother he owed his high-bred courtesy and his deeply seated reverence for religion. The Ramsays of Dalhousie (or Dalwolsie) in Midlothian were a branch of the main line of Scottish Ramsays, of whom the earliest known is Simon de Ramsay, of Huntingdon, England, mentioned in 1140 as the grantee of lands in West Lothian at the hands of David I. A Sir William de Ramsay of Dalhousie swore fealty to King Edward I in 1296, but is famous for having in 1320 signed the letter to the pope asserting the independence of Scotland; and his supposed son, Sir Alexander Ramsay (d. 1342), was the Scottish patriot and capturer of Roxburgh Castle (1342), who, having been made warder of the castle and sheriff of Teviotdale by David II, was soon afterwards carried off and starved to death by his predecessor, the Douglas, in revenge. Sir John Ramsay of Dalhousie (1580-1626), James VI's favorite, is famous for rescuing the king in the Gowrie conspiracy, and was created (1606) Viscount Haddington and Lord Ramsay of Barns (subsequently baron of Kingston and earl of Holderness in England). The barony of Ramsay of Meirose was granted in 1618 to his brother George Ramsay of Dalhousie (d. 1629), whose son William Ramsay (d. 1674) was made 1st earl of Dalhousie in 1633. The 9th earl was in 1815 created Baron Dalhousie in the peerage of the United Kingdom, and had three sons, the two elder of whom died early. His youngest son, the subject of this article, was small in stature, but his firm chiselled mouth, high forehead and masterful manner intimated a dignity that none could overlook. Yet his early life gave little promise of the dominating force of his character or of his ability to rise to the full height of his splendid opportunities. Nor did those brought into closest intimacy with him, whether at school or at Oxford, suspect the higher qualities of statesmanship which afterwards established his fame on so firm a foundation. Several years of his early boyhood were spent with his father and mother in Canada, reminiscences of which were still vivid with him when governor-general of India. Returning to Scotland he was prepared for Harrow, where he entered in 1825. Two years later he was removed from school, his entire education being entrusted to the Rev. Mr. Temple, incumbent of a quiet parish in Staffordshire. To this gentleman he referred in later days as having taught him all he knew, and to his training he must have owed those habits of regularity and that indomitable industry which marked his adult life. In October 1829 he passed on to Christ Church, Oxford, where he worked fairly hard, won some distinction, and made many lifelong friends. His studies, however, were so greatly interrupted by the protracted illness and death in 1832 of his only surviving brother, that Lord Ramsay, as he then became, had to content himself with entering for a "pass" degree, though the examiners marked their appreciation of his work by placing him in the fourth class of honors for Michaelmas 1833. He then travelled in Italy and Switzerland, enriching with copious entries the diary which he religiously kept up through life, and storing his mind with valuable observations. An unsuccessful but courageous contest at the general election in 1835 for one of the seats in parliament for Edinburgh, fought against such veterans as the future speaker, James Abercrombie, afterwards Lord Dunfermline, and John Campbell, future lord chancellor, was followed in 1837 by Ramsay's return to the House of Commons as member for East Lothian. In the previous year he had married Lady Susan Hay, daughter of the marquess of Tweeddale, whose companionship was his chief support in India, and whose death in 1853 left him a heartbroken man. in 1838 his father had died after a long illness, while less than a year later he lost his mother. Succeeding to the peerage, the new earl soon made his mark in a speech delivered on the 16th of June 1840 in support of Lord Aberdeen's Church of Scotland Benefices Bill, a controversy arising out of the Auchterarder case, in which he had already taken part in the "general assembly" in opposition to Dr. Thomas Chalmers. In May 1843 he became vice-president of the board of trade, Gladstone being president, and was sworn in as a member of the privy council. Succeeding Gladstone as president in 1845, he threw himself into the work during the crisis of the railway mania with such energy that his health partially broke down under the strain. In the struggle over the corn laws he ranged himself on the side of Sir Robert Peel, and, after the failure of Lord John Russell to form a ministry he resumed his post at the board of trade, entering the cabinet on the retirement of Lord Stanley. When Peel resigned office in June 1846, Lord John offered Dalhousie a seat in the cabinet, an offer which he declined from a fear that acceptance might involve the loss of public character. Another attempt to secure his services in the appointment of president of the railway board was equally unsuccessful; but in 1847 he accepted the post of governor-general of India in succession to Lord Hardinge, on the understanding that he was to be left in "entire and unquestioned possession" of his own "personal independence with reference to party politics." Dalhousie assumed charge of his dual duties as governor-general of India and governor of Bengal on the 12th of January 1848, and shortly afterwards he was honored with the green ribbon of the Order of the Thistle. In writing to the president of the board of control, Sir John Hobhouse, he was able to assure him that everything was quiet. This statement, however, was to be falsified by events almost before it could reach England. For on the 19th of April Vans Agnew of the civil service and Lieutenant Anderson of the Bombay European regiment, having been sent to take charge of Multan from Diwan Mulraj, were murdered there, and within a short time the Sikh troops and sardars joined in open rebellion. Dalhousie agreed with Sir Hugh Gough, the commander-in-chief, that the Company's military forces were neither adequately equipped with transport and supplies, nor otherwise prepared to take the field immediately. He also foresaw the spread of the rebellion, and the necessity that must arise, not merely for the capture of Multan, but also for the entire subjugation of the Punjab. He therefore resolutely delayed to strike, organized a strong army for operations in November, and himself proceeded to the Punjab. Despite the brilliant successes gained by Herbert Edwardes in conflict with Mulraj, and Gough's indecisive victories at Ramnagar in November, at Sadulapur in December, and at Chillianwalla in the following month, the stubborn resistance at Multan showed that the task required the utmost resources of the government. At length, on the 22nd of January 1849, the Multan fortress was taken by General Whish, who was thus set at liberty to join Gough at Gujrat. Here a complete victory was won on the 21st of February, the Sikh army surrendered at Rawal Pindi, and their Afghan allies were chased out of India. For his services the Earl of Dalhousie received the thanks of parliament and a step in the peerage, as marquess. The war being now over, Dalhousie, without waiting for instructions from home, annexed the Punjab, and made provision for the custody and education of the infant maharaja. For the present the province was administered by a triumvirate under the personal supervision of the governor-general, and later, a place having been found for Henry Lawrence in Rajputana, by John Lawrence as sole commissioner. Twice did Dalhousie tour through its length and breadth, settling on the spot all matters of importance, and when he left India no province could show a better record of progress. One further addition to the empire was made by conquest. The arrogant Burmese court at Ava was bound by the treaty of Yandabo, 1826, to protect British ships in Burmese waters, but the outrageous conduct of the governor of Rangoon towards the masters of the "Monarch" and "Champion" met with no redress from the king. Daihousie adopted the maxim of Lord Wellesley "that an insult offered to the British flag at the mouth of the Ganges should be resented as promptly and fully as an insult offered at the mouth of the Thames"; but, anxious to save the cost of war, he tried to settle the dispute by diplomacy. When that failed he made vigorous preparation for the campaign to be undertaken in the autumn, giving his attention to the adequate provision of rations, boat transport, and medical supplies, composing differences between the military contingents from Bengal and Madras, and between the military and naval forces employed, and conferring with General Godwin whom he had chosen to command the expedition. Martaban was taken on the 5th of April 1852, and Rangoon and Bassein shortly afterwards. Since, however, the court of Ava showed no sign of submission, the second campaign opened in October, and after the capture of Prome and Pegu the annexation of the province of Pegu was declared by a proclamation dated the 20th of December 1853. To any further invasion of the Burmese empire Dalhousie was firmly opposed, being content to consolidate the Company's possessions by uniting Arakan to Tenasserim. By his wise policy he pacified the new province, placing Colonel Arthur Phayre in sole charge of it, personally visiting it, and establishing a complete system of telegraphs and communications. These military operations added force to the conviction which Dalhousie had formed of the need of consolidating the Company's ill-knit possessions, and as a step in that direction he decided to apply the doctrine of "lapse", and annex any Hindu native states, created or revived by the grants of the British government, in which there was a failure of male lineal descendants, reserving for consideration the policy of permitting adoptions in other Hindu chief ships tributary and subordinate to the British government as paramount. Under the first head he recommended the annexation of Satara in January 1849, of Jaitpur and Sambalpur in the same year, and of Jhansi and Nagpur in 1853. In these cases his action was approved by the home authorities, but his proposal to annex Karauli in 1849 was disallowed, while Baghat and the petty estate of Udaipur, which he had annexed in 1851 and 1852 respectively, were afterwards restored to native rule. Other measures with the same object were carried out in the Company's own territories. Bengal, too long ruled by the governor-general or his delegate, was placed under a separate lieutenant-governor in May 1854; a department of public works was established in each presidency, and engineering colleges were provided. An imperial system of telegraphs followed; the first link of railway communication was completed in 1855; well-considered plans mapped out the course of other lines and their method of administration; the Ganges canal, which then exceeded "all the irrigation lines of Lombardy and Egypt together", was completed; and despite the cost of wars in the Punjab and Burma, liberal provision was made for metalled roads and bridges. The useless military boards were swept away; selection took the place of seniority in the higher commands; an army clothing and a stud department were created, and the medical service underwent complete reorganization. "Unity of authority coupled with direct responsibility" was the keynote of his policy. In nine masterly minutes he suggested means for strengthening the Company's European forces, calling attention to the dangers that threatened the English community, "a handful of scattered strangers"; but beyond the additional powers of recruitment which at his entreaty were granted in the last charter act of 1853, his proposals were shelved by the home authorities, who scented no danger and wished to avoid expense. In his administration Dalhousie vigorously asserted the control of the civil government over military affairs, and when Sir Charles Napier ordered certain allowances, given as compensation for the dearness of provisions, to be granted to the sepoys on a system which had not been sanctioned from headquarters, and threatened to repeat the offense, the governor-general found it necessary to administer such a rebuke that the hot-headed soldier resigned his command. Dalhousie's reforms were not confined to the departments of public works and military affairs. He created an imperial system of post offices, reducing the rates of carrying letters and introducing postage stamps. To him India owes the first department of public instruction; it was he who placed the jails under proper inspection, abolishing the practice of branding convicts; put down the crime of meriahs or human sacrifices; freed converts to other religions from the loss of their civil rights; inaugurated the system of administrative reports; and enlarged and dignified the legislative council of India. His wide interest in everything that concerned the welfare of the country was shown in the encouragement he gave to the culture of tea, in his protection of forests, in the preservation of ancient and historic monuments. With the object of improving civil administration, he closed the useless college in Calcutta for the education of young civilians, establishing in its place a proper system of training them in mufasal stations, and subjecting them to departmental examinations. He was equally careful of the well-being of the European soldier, providing him with healthy recreations and public gardens. To the civil service he gave improved leave and pension rules, while he purified its moral by forbidding all share in trading concerns, by vigorously punishing insolvents, and by his personal example of careful selection in the matter of patronage. As a comprehensive view of the constitution of the Indian government, dealing with the functions of its various members and the different parts of the official machinery, nothing could be more masterly than his minute of the 13th of October 1852. Indeed no governor-general ever penned a larger number of weighty papers dealing with public affairs in India. Even after laying down office and while on his way home, he forced himself, ill as he was, to review his own administration in a document of such importance that the House of Commons gave orders for its being printed (Blue Book 245 of 1856). His foreign policy was guided by a desire to recognize the "independence" of the larger native states, and to avoid extending the political relations of his government with foreign powers outside India. Pressed to intervene in Hyderabad, he refused to do so, laying down the doctrine that interference was only justified "if the administration of native princes tends unquestionably to the injury of the subjects or of the allies of the British government." Protection in his view carried no right of interference in the affairs of what he called "independent" states. In this spirit he negotiated in 1853 a treaty with the nizam, which provided funds for the maintenance of the contingent kept up by the British in support of that prince's authority, by the assignment of the Berars in lieu of annual payments of the cost and large outstanding arrears. "The Berar treaty", he told Sir Charles Wood, "is more likely to keep the nizam on his throne than anything that has happened for fifty years to him", while at the same time the control thus acquired over a strip of territory intervening between Bombay and Nagpur promoted his policy of consolidation and his schemes of railway extension. The same spirit induced him to tolerate a war of succession in Bahawalpur, so long as the contending candidates did not violate British territory. This reluctance to increase his responsibilities further caused him to refrain from punishing Dost Mahommed for the part he had taken in the Sikh War, and resolutely to refuse to enter upon any negotiations until the amir himself came forward. Then he steered a middle course between the proposals of his own agent, Herbert Edwardes, who advocated an offensive alliance, and those of John Lawrence, who would have avoided any sort of engagement. He himself drafted the short treaty of peace and friendship which Lawrence signed in 1855, that officer receiving in 1856 the order of K.C.B. in acknowledgment of his services in the matter. 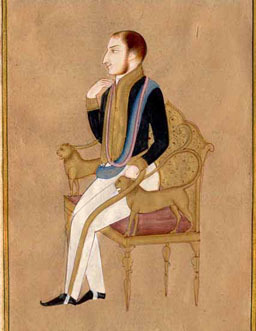 While, however, Dalhousie was content with a mutual engagement with the Afghan chief, binding each party to respect the territories of the other, he saw that a larger measure of interference was needed in Baluchistan, and with the khan of Kalat he authorized Major Jacob to negotiate a treaty of subordinate cooperation on the 14th of May 1854. The khan was guaranteed an annual subsidy of Rs.50,000, in return for the treaty which "bound him to us wholly and exclusively." To this the home authorities demurred, but the engagement was duly ratified, and the subsidy was largely increased by Dalhousie's successors. On the other hand, he insisted on leaving all matters concerning Persia and Central Asia to the decision of the queen's advisers. The frontier tribesmen it was obviously necessary to coerce into good behaviour after the annexation of the Punjab. "The hillmen", he wrote, "regard the plains as their food and prey", and the Afridis, Mohmands, Black Mountain tribes, Waziris and others had to be taught that their new neighbors would not tolerate outrages. But he proclaimed to one and all his desire for peace, and urged upon them the duty of tribal responsibility. The settlement of the Oudh question was reserved to the last. The home authorities had begged Dalhousie to prolong his tenure of office during the Crimean War, but the difficulties of the problem no less than complications elsewhere had induced him to delay operations. In 1854 he appointed James Outram as resident at the court of Lucknow, directing him to submit a report on the condition of the province. This was furnished in March 1855. But though the state of disorder and misrule revealed by it called for prompt remedy, Dalhousie, looking at the treaty of 1801, considered that he was bound to proceed in the matter of reform with the king's consent. He proposed, therefore, to demand a transfer to the Company of the entire administration, the king merely retaining his royal rank, certain privileges in the courts, and a liberal allowance. If he should refuse this arrangement, a general rising was almost certain to follow, and then the British government would of necessity intervene on its own terms. On the 21st of November 1855 the court of directors instructed Dalhousie to assume the powers essential to the permanence of good government in Oudh, and to give the king no option unless he was sure that his majesty would surrender the administration rather than risk a revolution. Dalhousie was in wretched health and on the eve of retirement when the belated orders reached him; but he at once laid down instructions for Outram in every detail, moved up troops, and elaborated a scheme of government with particular orders as to conciliating local opinion. The king refused to sign the treaty put before him, and a proclamation annexing the province was therefore issued on the 13th of February 1856. Only one important matter now remained to him before quitting office. The insurrection of the half-civilized Kolarian Santals of Bengal against the extortions of landlords and moneylenders had been severely repressed, but the causes of the insurrection had still to be reviewed and a remedy provided. By removing the tract of country from the ordinary regulations, enforcing the residence of British officers there, and employing the Santal headmen in a local police, he ensured a system of administration which afterwards proved eminently successful. At length, after seven years of strenuous labor, Dalhousie, on the 6th of March 1856, set sail for England on board the Company's "Firoze", an object of general sympathy and not less general respect. At Alexandria he was carried by H.M.S. "Caradoc" to Malta, and from there by the "Tribune" to Spithead, which he reached on the 1lth of May. His return had been eagerly looked for by statesmen who hoped that he would resume his public career, by the Company which voted him an annual pension of �5000, by public bodies which showered upon him every mark of respect, and by the queen who earnestly prayed for the "blessing of restored health and strength." That blessing was not to be his. He lingered on, seeking sunshine in Malta and medical treatment at Malvern, Edinburgh and other places in vain obedience to his doctors. The outbreak of the mutiny led to bitter attacks at home upon his policy, and to strange misrepresentation of his public acts, while on the other hand John Lawrence invoked his counsel and influence, and those who really knew his work in India cried out, "Oh, for a dictator", and his return "for one hour." To all these cries he turned a deaf ear, refusing to embarrass those who were responsible by any expressions of opinion, declining to undertake his own defense or to assist in his vindication through the public press, and by his last directions sealing up his private journal and papers of personal interest against publication until fifty years after his death. On the 9th of August 1859 his youngest daughter, Edith, was married at Dalhousie Castle to Sir James Fergusson, Bart. In the same castle Dalhousie died on the 19th of December 1860; he was buried in the old churchyard of Cockpen. Dalhousie's family consisted of two daughters, and the marquessate became extinct at his death.